Written by Nicole Kohler on October 30, 2015 Blog, Build your business, Holiday ideas, WooCommerce. We’ve been talking about the holidays quite a lot lately. We’ve stressed the importance of being prepared, how to find out what your customers want, and the actions you should take to have a stress-free season. Having said all that, if you don’t already have the wheels in motion for some holiday sales or events on your WooCommerce store, it’s not too late! In fact, you’ve still got plenty of time to come up with some stellar holiday tactics, thanks in part to WooCommerce’s flexibility and hundreds of easy-to-add extensions. To give you the push you need to start your planning — or just to help you along, if your plans are well underway — we’ve collected ten of our favorite extensions for holiday success. From shipping add-ons to kind gestures, these extensions will help you attract more shoppers, ship more packages, and have the best holiday ever. Interested? Have a look at what we’ve picked out just for you. To consumers, the holiday shopping season means one thing and one thing only: discounts. 73% of holiday purchases are influenced by discounts and other promotions, which means offering these deals on your store — and getting the timing right on top of that — is crucial to anyone looking to motivate more sales. Here are four WooCommerce extensions you can use to offer those coveted holiday discounts and deals to your customers. Sure, some customers are willing to hunt high and low for the best price possible. They’ll spend as long as it takes to find your store’s hidden coupons and elusive deals. But not every customer wants to leave your site to find a discount. In fact, there’s a very real risk that they could get distracted along the way — or simply give up before they find anything. Enter Smart Coupons. 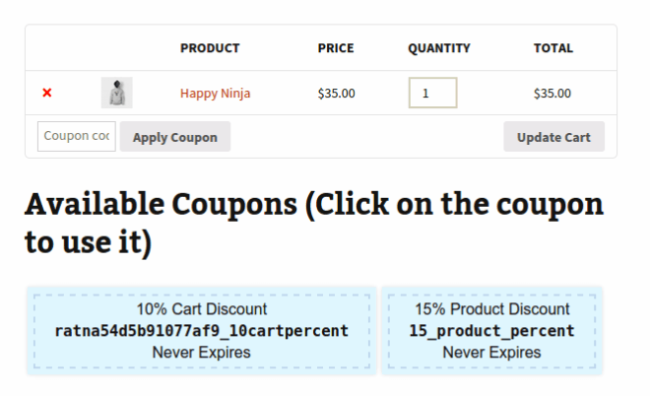 One of the benefits of this versatile coupon extension is that it allows you to show available coupons and discounts right on your website — for example, in the shopping cart (once you’ve added an applicable item) or on a dedicated page. Apply available coupons with a single click. No detective work required. If you’re willing to extend special offers like these, you might as well make them easy to find — and avoid potentially losing your shoppers to the other distractions of the Internet (and there are a great many!). Tedious. Let’s cut those steps back, shall we? 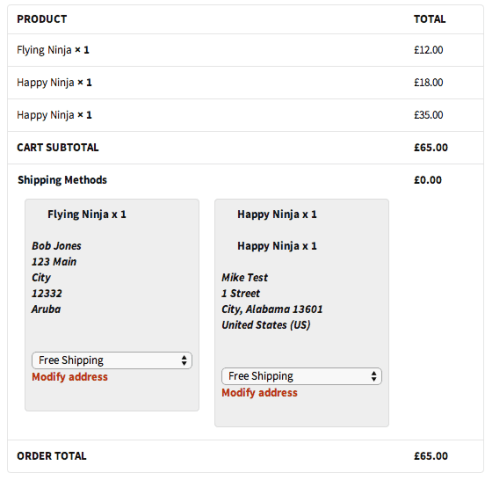 URL Coupons can automatically apply a coupon code to any WooCommerce customer’s cart, and even add one or more products of your choosing… automatically. With this nifty extension, you create customer-friendly URLs — say “yourstore.com/coupon-code.” When a customer visits one of these URLs, the extension kicks in, applying a pre-created discount to the cart, or even adding specific products of your choosing. Sounds like a dream compared to that copy-pasting, hunting-through-emails scenario. Got some customers who are deserving of a treat? Maybe they’ve been especially kind to you in the past, or you’d just like to send them a nice surprise? 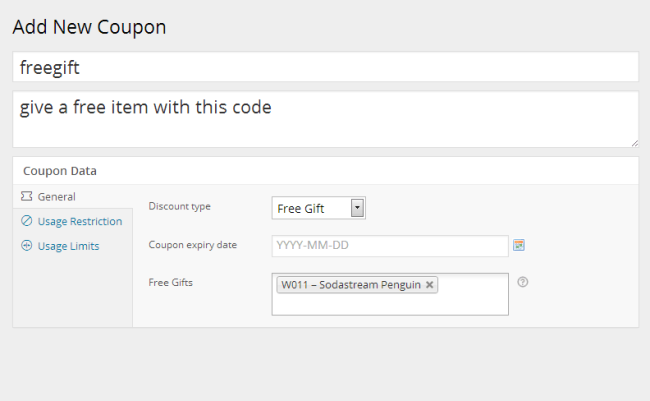 The Store Credit extension allows you to immediately generate and send unique coupon codes to customers of your choosing. This gives you the power to discount any customer’s order by any amount, be it a few dollars or hundreds. Simply enter your customer’s email and how much credit you’d like to send. Simple and fast. While most store owners would think to use this in the event of a return or exchange, it could also prove useful around the holidays. After all, kindness goes a long way, especially when you’re hoping to motivate shoppers to choose your store over another! So let’s say you’d like to give away free gift wrapping with all of your orders. Or perhaps you’d like to offer a small free item for any of your customers who order within a specific time period. … and presto: customers who enter your designated code at checkout will be entitled to one (or more!) gifts for free. Use it permanently or for a limited time — your choice. If you want your holiday shipments to go smoothly — and your customers to shop with you again once the season has ended — it’s going to take careful planning, attention to detail, and dedication from your team. Need a helping hand? Try these three shipping extensions on for size. Marking your orders as “shipped” without providing tracking info to your customers? Not giving your customers an easy way to keep track of the progress of their packages? Put an end to the mystery with the Shipment Tracking extension. Give your customers a heads-up on their shipments. When you add tracking numbers (or links) to an order with this extension, they’ll automatically populate in your customers’ order emails, on their account page, and on the order view page. This gives them multiple ways to keep an eye out for their orders, and it keeps them in the loop. This extension also supports multiple carriers in multiple countries, so there’s a good bet your shipper of choice will work here. During the holidays, you’re likely to see customers buying from you for multiple recipients. This isn’t an issue if they’re shipping the items to themselves to wrap and present in person, but what if their recipients live far, far away from them… and one another? As you might have guessed, we’ve a solution for this, too: an extension that lets you divvy up one order’s goods and Ship to Multiple Addresses. This goes here, this goes there, and everyone is happy. When multiple addresses are enabled, your customers will see a notice in the shopping cart about it — though it’s not a bad idea to mention this elsewhere, too, to see how it helps your conversion rates! Once products have been added to the cart, shoppers can specify which products go to which destination, and choose different shipping rates for each if need be. They’ll only need to place one order and pay one amount, and then can relax while you take care of the rest. As delighted as your customers will be to receive their holiday gifts from you, they aren’t always delighted when they arrive home from work or an errand to find the dreaded failed delivery slip on their door. There is, remarkably, a way to prevent these missed deliveries and unnecessary delays. 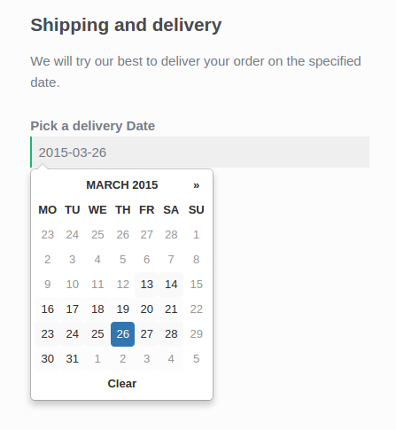 You can now give customers the power to select their own delivery date with the WooCommerce Order Delivery extension. Customers can pick their own delivery date at checkout, and you’ll be given a shipping date that corresponds. 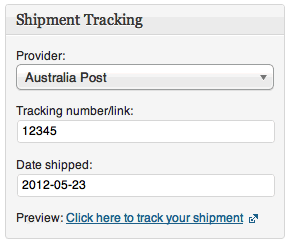 Based on estimated shipping times to the selected destination, a customer will be able to pick an available delivery day from the calendar that appears (as shown above). You, the store owner, will then be prompted to ship the order on the correct day — no earlier, no later. Your customer will get their order on time, when they’re at home and anticipating a delivery. You’ll ship orders according to your customers’ wishes. And everyone will avoid those annoying slips. Sounds like a winner, eh? Whether your customers celebrate Christmas, Hanukkah, or another holiday, they’ll want to know that they can get their gifts from you in time. Making your store’s holiday deadlines crystal clear can help eliminate any confusion before it occurs. Here are two ideal ways you can communicate your store’s deadlines. You have the full attention of your customers the moment a product is added to their shopping cart. In that moment, they’re halfway to a purchase — they’re feeling good about your store and your products. An in-cart notice is hard to miss. Speaking of product-only specials, you’ve probably got a few items in your store that have special discounts just for the holidays, right? Or are you considering putting just a few select products on sale for a limited time? Add in some content to display based on sale end date (or any other criteria). Much like the extension above, WooCommerce Conditional Content has quite a few handy features that you might find useful year-round. But during the holiday season, where a few items might be on sale for one period and others for another, you can use it to display special messages related to the end date of those sales. 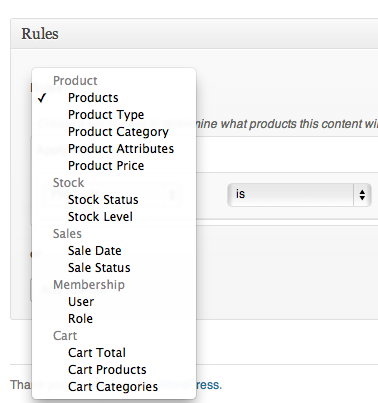 The extension allows you to define “rules” that trigger messages on products when they meet certain criteria. So, for example, if a product is on sale, you can create a rule for a “on sale” message. Or if the sale end date is approaching, you can create a rule forcing content to display warning customers that these products are about to go up in price again. Nifty, isn’t it? Give it a try — it’s rather helpful, and you can quite literally set it and forget it if you want. Have warm, fuzzy feelings about your customers? (We certainly do.) Want to give them something other than neatly packaged orders during the holidays? Why not offer them some custom content? It might sound silly, but your shoppers appreciate special content like gift guides, blog posts tailored to their interests, and downloadable PDFs. If it helps them make a decision — or just puts a smile on their face — they’ll be sure to think of you fondly the next time they’re shopping for a product you happen to sell. To top off this roundup, here’s our final recommendation: a WooCommerce extension that allows you to offer special content just for your holiday shoppers. So let’s say your store sells something that can be matched with other items in a set — clothing, perhaps. Upsells and cross-sells are successful, undoubtedly, but sometimes customers want to see how your products look together, like how a shirt goes with pants or a skirt. In this case, it might make sense for you to create a gift guide, or perhaps a one page styling PDF for that item of clothing. And then you can add it for download — for free — on that product page. The extension you need to accomplish this? Product Documents, which allows you to link up one or more document of any type (including videos!) to any product page. Add as many documents as you like to each individual page. This opens up lots of opportunities for holiday content, from gift guides to how-tos to crafts and projects. Cross-sells are good, but content might be even better. Sell away, friends. Which extensions are you using for the holidays? Though we’ve recommended ten of our favorite holiday extensions here, we know this is just one of many possible combinations for success. We’d like to hear from you: which WooCommerce extensions will you be using during this holiday season? Do you have any favorites that have helped you increase sales in the past? Or have you discovered one via this post that you think will boost your profits this year? Let’s hear it, everyone — the comments await you. It is actually surprising how important it is to have your costumers the option to select a certain select their own delivery date.